Some random thoughts after sitting in my first week of rehearsals. This does raise the point that I can’t get into this as much as I’d like – it’s hard to talk about what happens in a room without betraying trust. The main thing is this: for the most part, process here is very similar to back in Canada, but there is more time. A lot more time. So this means, more talking more exploring, more prep before putting it front of people, more time on stage, etc. However, Matthew is used to even more time. More time to work the chorus (they are onstage for 65 mins) more time to work the lighting designer (we are in levels right now, the lx designer has never seen a run-thru, and there less than 3 full days to design and program it all) and so on. The stage manager doesn’t join in until much later in the game. At this point there are a couple of Assistant Directors, Ludivin and Oreste, who seem to be taking on these type of duties. The stage manager, who is busy with other shows, will come on board when we start adding tech. I wish I knew way more languages. The opera is in Italian. It’s a German producing company. Matthew, the director, speaks English and French and quickly improving German. The set designer speaks French. Matthew mainly speaks to the Assistant Directors in French who translate to the chorus in German. Matthew mainly talks to the principals in English. The principals seem to be able to speak English, German, French, and Italian. 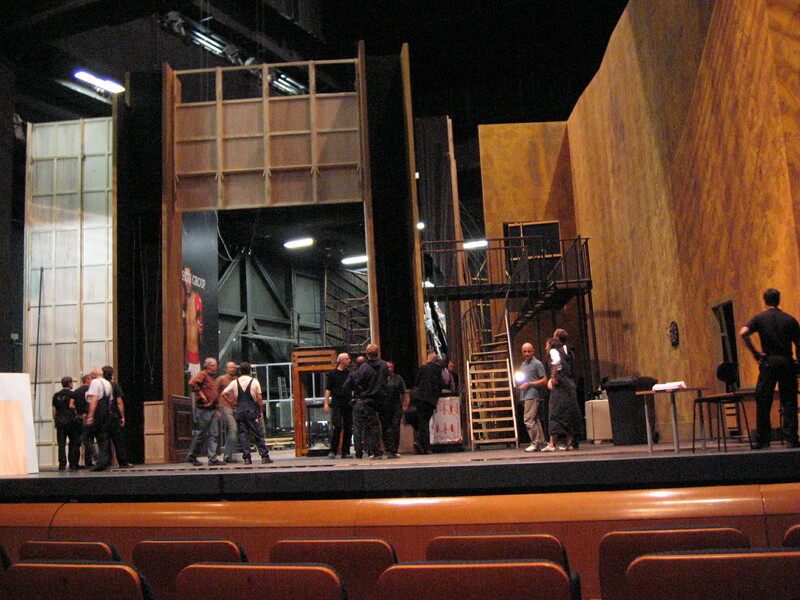 Oper Frankfurt has the largest revolving stage in Europe. It’s a massive revolving thing (118 metres in circumference) that can fit several shows. There is very little tape on the floor in the rehearsal hall. They actually have the levels and major set pieces like walls and staircases in rehearsal. It sure makes the transfer to the stage that much easier. There is crew on hand to make the scene changes as needed. Previous Previous post: Notes From Frankfurt 1. Next Next post: Opera in Germany.